Information is exploding and most digitally-connected Americans think that has brought benefits to them personally and to the broader culture, despite the ceaseless flow of commentary about information overload. It is not easy to figure out exactly how much material flows into and out of people’s lives, but there is no doubt that there is much more than the not-so-distant past. One elaborate study projected that by 2015, Americans will consume 1.7 trillion hours of traditional and digital media. That is an average of 15.5 hours of media per person per day of 30 different kinds of media in video, print, audio, and gaming formats and allows for lots of multi-tasking. That projection came after watching 5% growth per year in the amount of information and media in people’s lives between 2008 and 2013. That work built on previous scholarship showing that the average American in 2008 was processing over 100,500 words per day in various formats—a 140% increase from 1980. Over the years, the Pew Research Center has asked internet users a variety of questions about the role of the internet in their lives and the impact their internet use has had on key aspects of their lives. This report focuses on the issue: Do the internet and cell phones help people learn new things and feel better informed? And does this outweigh any possible feelings of information overload? Along with younger adult internet users, those living in higher income households are also more likely to see these technologies having an impact on their ability to learn new things. Six in ten (59%) web users living in households with incomes of $75,000 or more say the internet and cell phones have improved their ability to learn “a lot,” a figure that drops to 44% among those in households with incomes below $30,000. An internet user’s education level is also related to their perceptions of the internet’s impact in this area, with adults at the higher end of the educational spectrum reporting more of an impact than those in the lower end. Online Americans who have attended or graduated from college are more likely than those who have not (60% v. 43%) to say the internet and cell phones improve “a lot” their ability to learn new things. 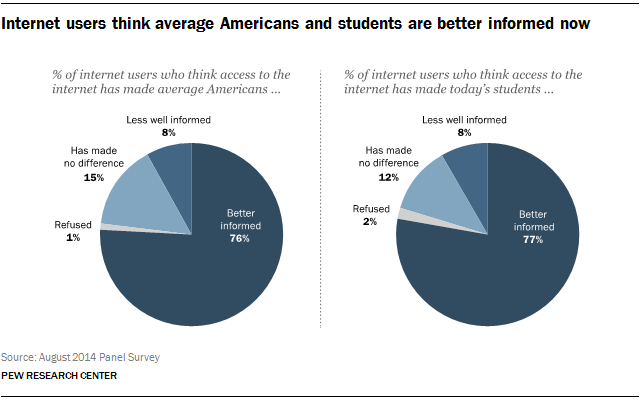 In addition to seeing an impact on their own ability to learn, large majorities of adult internet users believe both the “average American” and “today’s students” are better informed because of the internet. Three-quarters of online adults (76%) say access to the internet has made average Americans better informed, while just 8% say it has made average citizens less well-informed. The remainder say the internet has made no difference. Likewise, when asked if the internet has made today’s students better informed or less well-informed, 77% of web users say they are better informed. Again, just 8% say the internet has made today’s students less well-informed and the remainder see no impact. Interestingly enough, some of the heaviest users of the internet are less likely to believe that other Americans are benefiting from internet use. Younger adult internet users (those ages 18-29) are the least likely to believe the internet is making average Americans (66%) or today’s students (67%) better informed, and instead are more likely than their older counterparts to say the internet has no real impact. About one in five young online adults say the internet has had no real impact on how well-informed average Americans (23%) or today’s students (19%) are. Asked about the internet’s impact on how well-informed average Americans are, those at the two ends of the educational spectrum differ slightly from those in the middle. On this question, those who have graduated from high school are more likely than both those who have not graduated from high school and those who have graduated from college to say the internet has made average Americans better informed (81% v. 66% and 72% respectively). These differences disappear when asking about the internet’s impact on today’s students. To gauge the perceived impact of the internet in different topic areas, internet users were asked to think about being informed now on key issues, compared with five years ago: Did their use of the internet and cell phones make them better informed about each of 12 specific topics? Results reveal widely varying perceptions of how much impact the internet is having on respondents’ knowledge levels in different areas. Generally, respondents report digital technologies have made them better informed about topics further away or more removed from them personally, such as national news, international news, pop culture, and products and services to purchase. Topics that are more local, micro-local or personal in nature, including family, friends, local news, their health, local civic and government activities, and one’s own neighbors or neighborhood, tend to reveal less perceived impact. Each of the 12 topics is examined in detail below. Overall, 81% of adult internet users say their use of the internet and cell phones has made them better informed about products and services to buy than was the case five years ago. Internet users ages 65 and older are the least likely to report this is the case when compared with all other age groups. In addition, internet users who have not graduated from high school are less likely than those with higher educational attainment to feel better informed about products and services as a result of using the internet and cell phones. Overall, 75% of internet users say their use of the internet and cell phones has made them better informed about national news today than they were five years ago. This figure is slightly higher among internet users under age 50 when compared with those ages 50 and older (78% v. 70%). Internet users in the highest income households—those with annual household incomes of $75,000 or greater—are also slightly more likely than other adults (80% v. 71%) to say using digital technology has made them better informed about national news. International news elicits responses and demographic patterns similar to those found for national news. Overall, 74% of internet users say their use of the internet and cell phones has made them better informed in this area compared with five years ago. This figure is slightly higher among internet users under age 50 when compared with those ages 50 and older (78% v. 70%). Higher income internet users ($75,000 or higher annual household income) are slightly more likely than other adults (81% v. 70%) to perceive their internet and cell phone use making them better informed about international news. In the case of international news, educational differences also emerge, with web users who have been to college slightly more likely than those who have not been to college to say digital technology has made them better informed about what is happening in the world than they were five years ago (79% v. 68%). Asked if the internet and cell phones have made them better informed about pop culture than they were five years ago, 72% of adult internet users say yes. 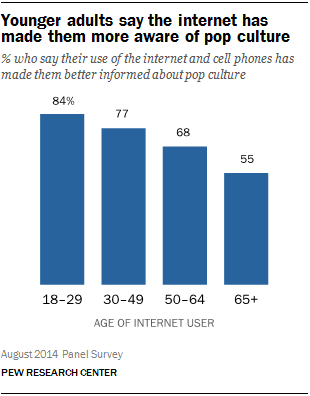 Age is a key factor on this front, with 18-29 year-old internet users the most likely to say digital technology has made them better informed about pop culture. Age is again a factor in whether respondents feel their use of the internet and cell phones has made them better informed about their personal hobbies and interests. Overall, 68% of internet users say this is the case, but that figure is lower among those ages 65 and older (56%) than it is among internet users ages 18-29 (78%), 30-49 (69%) and 50-64 (65%). When it comes to the impact of digital technology on their knowledge about people close to them, more internet users say they are better informed today about friends (67%) than say they are better informed about family (60%). More female than male internet users (70% v. 63%) say the internet and cell phones have made them better informed about their friends. Internet users under age 50 are also more likely than those ages 50 and older to say they feel better informed about their friends (71% v. 62%). These age differences disappear when asking about their knowledge of family. Overall, two-thirds of internet users (65%) say they are better informed about health and fitness today than they were five years because of their internet and cell phone use. The survey included a second question about health information which indicates similar impact in this area. Asked how much, if at all, digital technologies have improved their ability to get information about health and healthcare, 44% say these technologies have helped “a lot” and another 35% say they have helped “somewhat.” Just 20% say the internet and cell phones have had little or no impact on their ability to get health information. These figures are relatively consistent across all demographic subgroups, with the exception of the lowest income internet users. Among web users living in households with an annual income below $30,000, almost one-third (31%) say digital technologies have helped “only a little” or “not at all” in this area, the highest percentage of any demographic subgroup to report little to no impact. A March 2000 survey posed a similar question to internet users—“How much, if at all, has the internet improved the way you get information about healthcare?” At that time, far fewer internet users saw this relatively new technology having a significant impact on the way they got their health information. In 2000, just 13% of internet users saw the internet improving this “a lot” and just 12% saw the internet improving it “somewhat.” Fully half (49%) of internet users at the time said the internet had no impact at all on how they gathered information about healthcare. About six in ten internet users (62%) say their internet and cell phone use has made them better informed about local news than they were five years ago. As noted above, more internet users say the internet and cell phones have made them better informed about friends today (67%) than say they are better informed about family (60%). As was the case when asking about friends, more female than male internet users say the internet and cell phones have made them better informed about their family (65% v. 56%). Results for this item are similar to those found when asking about local news. About half of internet users (49%) say their internet and cell phone use has made them better informed about civic life and government activities in their community. This micro-local level elicits the least perceived impact among respondents. Just 39% overall say their internet and cell phone use makes them better informed today about their neighbors and neighborhood than was the case five years ago. Responses to this item vary across several demographics, including gender, race/ethnicity and age. Women and internet users under age 50 are all slightly more likely than their counterparts to report feeling better informed about their neighborhood and neighbors thanks to their cell phone and internet use. With the vast amount of information available online about all of these different topics, a common question is whether internet users like having so much information or feel overwhelmed by it. Responses show that a majority of internet users (72%) enjoy having so much information at their fingertips, while just 26% find it overwhelming. Women are slightly more likely than men to report feeling overwhelmed (30% v. 21%), as are internet users ages 50 and older when compared with those ages 18-49 (30% v. 22%). Still, across all demographic subgroups, large majorities report that they like having so much information available. These figures have remained relatively constant since the Pew Research Center began asking this question in 2000. It’s not just about learning—it’s also about sharing. Most people say the internet helps. Among internet users, those under age 50 are more likely to say this when compared with those ages 50 and older (47% v. 28%). The same question was asked of internet users in 2006 and 2007 in telephone surveys, and responses show the perceived impact of the internet on sharing ideas and creations growing steadily over time.